Daftech Engineers Pvt. Ltd. is a wastewater clarifier company that meets the needs of clients all over the world for Dissolved Air Flotation (DAF) Water Clarifier. Since our inception, we have been continually improving the design of our circular DAF units known as Floatcells. We manufacture complete line of wastewater clarifier, circular DAF wastewater clarifier with nominal capacities of 5 m3/hr to 2019 m3/hr. Today DAFTECH is known for its expertise in design, installation, operation, maintenance and troubleshooting of DAF water clarifier around the world. DAFTECH philosophy has been to work with various industries in developing a new generation of Dissolved Air Flotation Water Clarifier to provide efficient and cost-effective solutions for recovering valuable solids from process streams and clarifying their effluents. With quality raw materials, manufacturing expertise and experienced personnel as our pillars of strength we provide quality products at competitive price. Our commitment to excellence has taken us miles ahead of our competition. We have a worldwide presence of installations and have been exporting our Floatcells to international markets. DAFTECH’s Dissolved Air Flotation System is an excellent choice for reliable wastewater clarification in an easy-to-install-and-use package. DAFTECH’s Dissolved Air Flotation Clarifier can be configured for a tremendous variety of wastewater characteristics. DAFTECH’s Dissolved Air Flotation Clarifier comes standard with a surface skimmer of adjustable speed, an automatic bottom sludge purger and in fluent / effluent and floated sludge chambers. DAFTECH’s Dissolved Air Flotation Wastewater clarifier can handle difficult wastewater streams with combinations of chemical inputs including liquid poly electrolytes, dry powders and organic and inorganic coagulants. The fact that dissolved air flotation clarifiers or dissolved air flotation units (with 3 - 5 minutes of detention time) can replace sedimentation (with 2 - 3 hours of detention time) for clarification, has been overlooked by environmental engineers for many decades. Modern high rate DAF clarifiers have advanced to such an extent that they could overshadow conventional settling clarifiers in wastewater treatment. DAF hydraulic loading has increased from 1 L/m2.s to 2.5 L/m2.s and for a triple stacked unit to 7.5 L/m2.s. The detention time has decreased from 30 minutes to 3 minutes. Air dissolving is improved and now requires only 10 seconds retention time in the air mixing tube instead of the previous 60 seconds. The smaller size and weight of a modern DAF unit allow for inexpensive construction and flexibility of erection using prefabricated units. The availability of excellent flocculating chemicals gives a high stability of operation and high clarification degree. DAFTECH Floatcells are circular in shape, ranging in diameter from 1.2 to 16.8 meters and a liquid depth of only 0.65 meter. The complete set up consists of a flotation tank, feed pump, pressure pump, compressor, air mixing tube, chemical feed system and a spiral scoop for collection and removal of floated sludge. 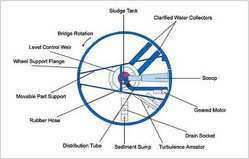 The inlet, outlet and sludge removal mechanisms are contained in the central rotating section. This section and the spiral scoop rotate around the tank at a speed synchronized with the flow. 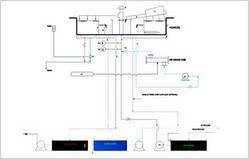 The system is operated in the recycle flow pressurization mode where a portion of clarified effluent (25 - 30 percent) is continuously recycled from the DAF tank to the air mixing tube at about 6.5 bar pressure. After pressure release, the aerated water is mixed with the influent flow just before the inlet to the distribution duct that moves with the same velocity, but in opposite direction to the incoming flow thus creating a quiescent state in the flotation chamber. Fine bubbles generated in this manner attach to the suspended particles and make them float to the surface. The spiral scoop takes up the floated sludge, pouring it into the stationary center section where it is discharged by gravity. Clarified water is removed by extraction pipes, which are attached to the moving center section and discharged. Wiper blades attached to the moving distribution duct scrape the bottom and the sides of the tank and discharge settled sludge into the built-in sump for periodic purging. Variable speed geared motors drive the rotating elements and scoop. Electrical current for the geared motors are fed from a rotary contact mounted on the central shaft. Daftech Engineers Pvt. Ltd. is a wastewater clarifier company that meets the needs of clients all over the world for Dissolved Air Flotation (DAF) Clarifier. Since our inception, we have been continually improving the design of our circular DAF units known as Floatcells. We manufacture and export complete line of wastewater clarifier, circular DAF wastewater clarifier with nominal capacities of 5 m3/hr to 2019 m3/hr. Today DAFtech is known for its expertise in design, installation, operation, maintenance and troubleshooting of DAF water clarifier around the world over. DAFtech’s philosophy has been to work with various industries in developing a new generation of Dissolved Air Flotation Water Clarifier to provide efficient and cost effective solutions for recovering valuable solids from process streams and clarifying their effluents. With quality raw materials, manufacturing expertise and experienced personnel as our pillars of strength we provide quality products at competitive price. Our commitment to excellence has taken us miles ahead of our competition. We have a worldwide presence of installations and have been exporting our Floatcells to the international markets. North America, South America, Europe, Africa, Middle East, Far East and South East Asia.